Sofiat, Kyrionna and Lakai are on their way to Indianapolis to attend the 2018 Annual Biomedical Research Conference for Minority Students (ABRCMS). They are all presenting posters during the conference and are just part of the large contingent of undergraduates that Howard University is sending. The Allen lab has been joined by 3 new undergraduate researchers this Fall 2018 semester. Welcome to the lab Jeandele, Donjayla, and Marvin. We can’t wait to see all the research you accomplish! In July 2018, Ruby Boating defended her Ph.D.! She will be starting a post-doctoral fellowship at The Jackson Laboratory in Bar Harbor, Maine in August. Dr. Allen is now a tenured, Associate Professor. 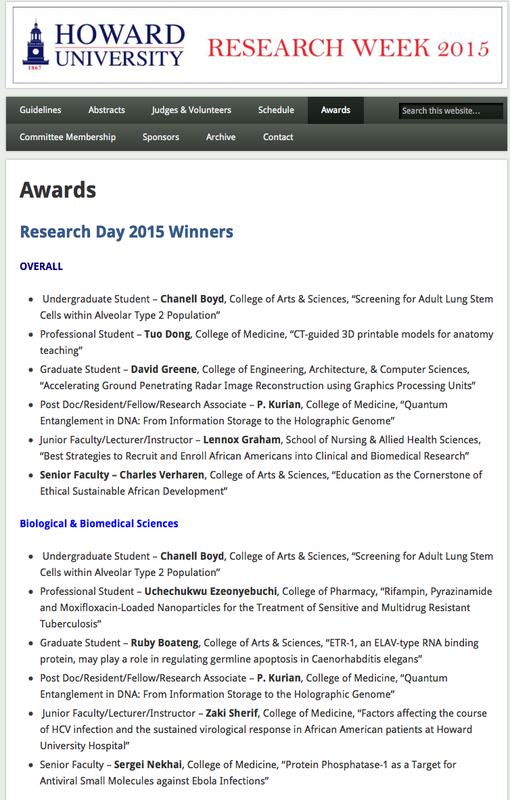 Thank you to everyone in the Allen lab for all their hard work that led to this accomplishment. Sara graduated this May and is off to start a research technician position in the laboratory of Dr. Brent Derry in Toronto. Best of luck Sara! We are so proud of you! The lab has a new graduate student now. Welcome Raina Rhoades! Raina is beginning to investigate some of the suppressors that came out of the 2014 wee-1.3(RNAi) suppression screen paper. Anna was fortune to attend this year’s Fertilization and Activation of Development meeting sponsored by the Gordon Research Conference. 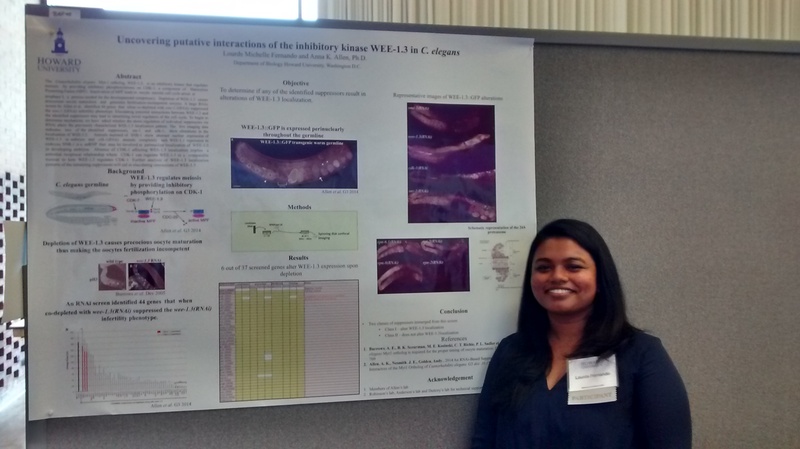 She presented work by both Ruby and Kristina on the “Characterization of a novel role for ETR-1 in C. elegans reproduction”. 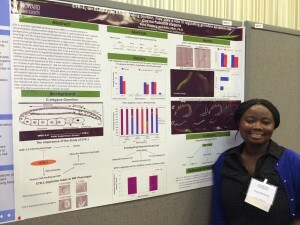 Ruby won a travel award through FASEB (Federation of American Societies for Experimental Biology) and the MARC (Maximizing Access to Research Careers) program to fund her travel to the 2015 International C. elegans meeting in Los Angeles, California this summer. It seems Ruby did an awesome job both in making her HU Research Day poster and presenting her data! She once again won an award for her poster in the Biological & Biomedical Sciences Graduate Student Category. Congrats Ruby! Keep up the good work. 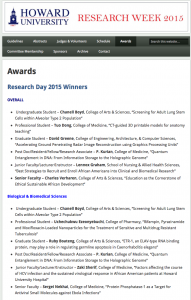 On Thursday, April 16th, Howard University celebrated its annual Research Day. Both Ruby and Michelle participated in the day by giving poster presentations. Dr. Allen didn’t present this year, but instead judged some of the posters.